It’s that time of year again here in still very sunny (and hot) Tuscany. 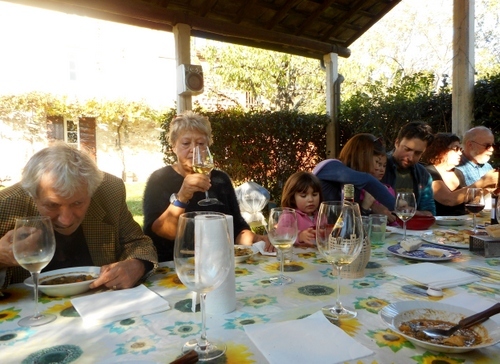 La Vendemmia, or the grape harvest, isn’t just an important horticultural operation, it’s a big social event where families call in their relatives and friends to help out with the picking and all join together for a big harvest lunch. It’s a fitting conclusion to the summer season and takes place at slightly different times depending on where one lives. Yesterday I visited friends who have a vineyard in the Compitese area south of Lucca but those closer to Bagni di Lucca will have to wait another week before their vendemmia starts because not only are they in a more northern latitude but also because their vineyards are at a higher altitude. Other factors in deciding when to vendemmiare is the grape variety. 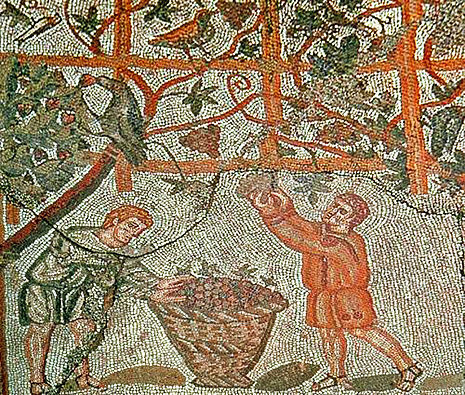 It’s better to collect white grapes slightly earlier than red ones and also to decide whether to have a passito wine i.e. a wine made with over-ripened grapes with higher sugar content. I love vendemmiare. All one needs is pair of secateurs (always remember where you put (or lose) them) and a hat to protect oneself against the often fierce noon-day sun. Then take a row of vines and start snipping away. Don’t forget, bunches of grapes have a funny way of hiding themselves behind vine leaves so always return a second time and, sure enough, you find some that you’ve missed. The next stage is to carry the bunches of grapes filling the bins or ex-supermarket bags to the mulcher. 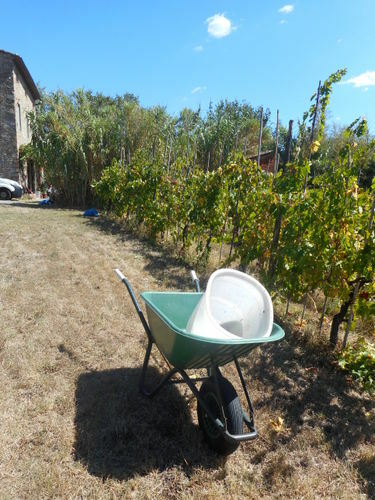 A wheelbarrow is useful here as bags of grapes can become quite heavy! It’s very important to keep the white grapes separated from the red for obvious reasons. The mulcher I used was a grand little machine which automatically separated the stalks from the grapes themselves. 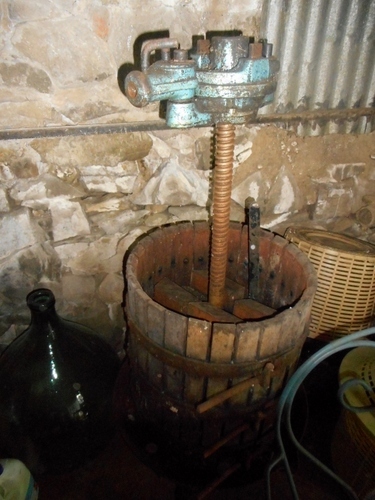 The juicy liquid was collected into a large tray which was then lifted over into the fermenting vat. No dancing around in a large vat with one’s unsocked feet here! Such practices are now considered old-fashioned. When it’s too hot to work then it’s surely lunchtime which we had in a traditional open-sided barn. Although very tempting, it’s useful not to drink too much wine at this stage. There’s an afternoon shift too! The general opinion was that, despite the heavy rains at the start of June, this has been very good year for the Vendemmia. True, since we haven’t had any proper rain for weeks some of the grapes appeared ‘passite’, or shrivelled but it is from such grapes that, in Pantelleria, the famous ‘passito’ wine is made since the passito grape has a much higher sugar content for its size. Furthermore, rain at this time of year just as the vendemmia starts could cause serious problems of mould on this god-like fruit which has given joy to so much of humankind since earliest times. 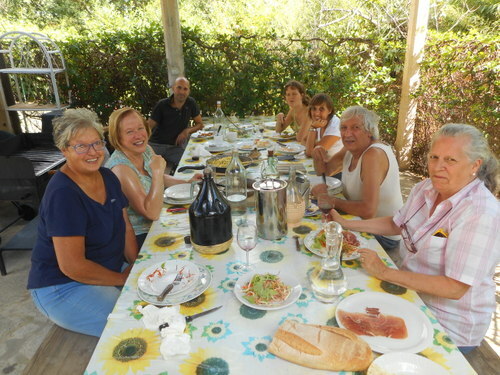 What better way to experience Italian (and international) friendship than joining in a Vendemmia. 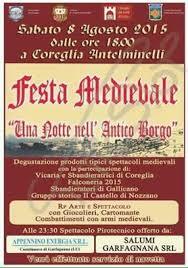 I’m sure, if you’re in Italy, you’ll find one to join in with. 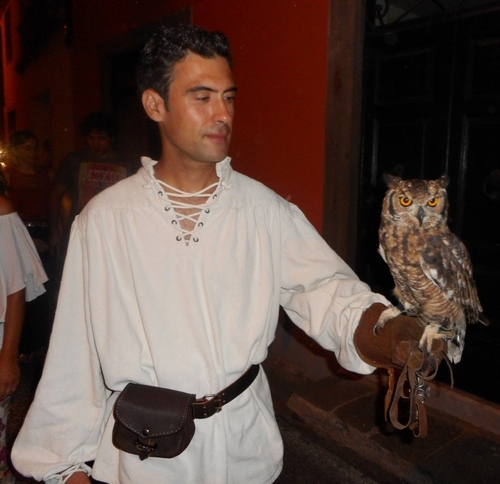 It’s truly a highlight of this country’s September which, in Lucca, is full of good things. 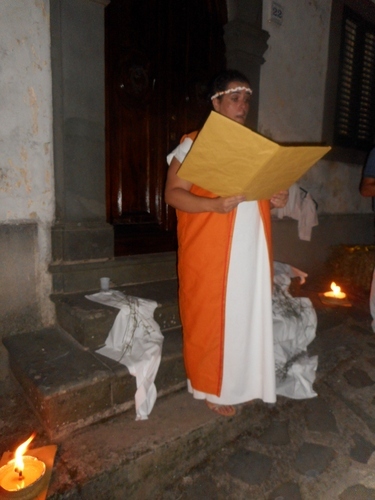 (Just check out the city’s site at http://www.comune.lucca.it/flex/cm/pages/ServeBLOB.php/L/IT/IDPagina/16116 to see how much happens in September including, of course the unmissable Holy Cross procession on the evening of the 13th of this month, one of Italy’s truly great pageants). Who knows? Perhaps one good thing that might emerge through of global warming is that the Vendemmia may become a regular social event in Sussex or Kent, as hop-picking (as described so specifically by George Orwell) once was. Thank you so much Silvana for sharing! I would like to know what happened to Liliana’s father Leo. And was there ever a photograph taken of Liliana? It must have been quite unendurable for Leo to realise that he’d lost his wife and children contrary to their last words to him. Anne Frank’s father was also in a similar position after the war. When one of us survives a terrible situation and our loved ones perish we clearly must feel unimaginably devastated. 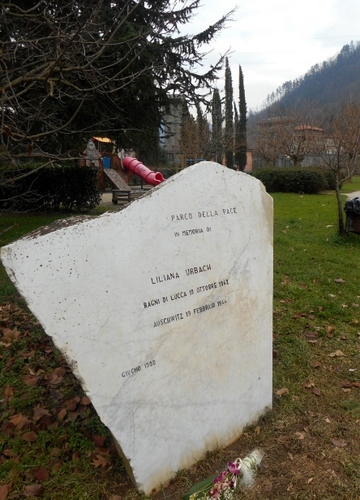 Primo Levi, another survivor, found his situation unbearable as anyone realises who has read his poignant book about his experience in ‘Se questo è un uomo…’ (If this is a man). 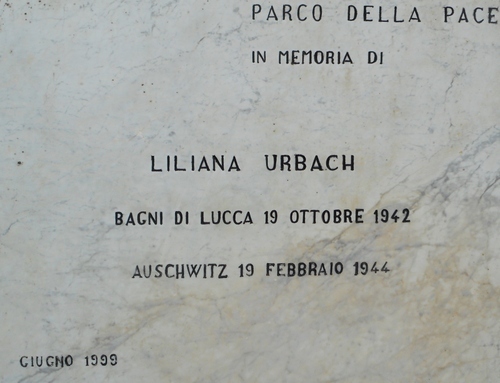 Indeed, I’m quite sure that this fine author’s – we’d met him when he came to England to attend an opera based on his libretto which had been translated into English – suicide in 1987 was to be explained by another survivor, Elie Wiesel’s words: “Primo Levi died at Auschwitz forty years later”. The Compitese is an area extending from the eastern slopes of the Monte Pisano, the hilly range that separates Pisa from Lucca (as Dante wrote in his Divine Comedy “Il monte per che i Pisan veder Lucca non ponno.” – The hill placed there so that the Pisans can’t see Lucca – like a barrier placed between Siamese fighting fish to prevent them fighting each other). 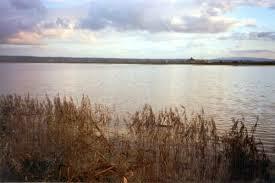 The Compitese descends onto a marshy plain which was once occupied by a large lake, Lago Bientina. This lake has been largely drained by the construction of a canal by the engineer Manetti in 1859. Today, however, in keeping with wild-life policy parts of the lake have been reclaimed as wetlands resulting in a protected area known as Padule di Bientina, a favourite breeding ground of migrating birds and a heaven for bird-watchers. 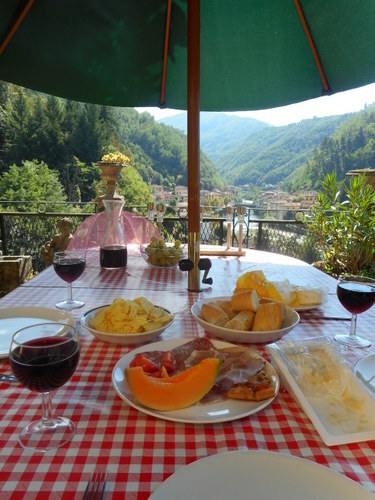 We visited friends at San Ginese di Compito last Sunday and were invited to an al fresco lunch in luxuriant sunshine. A sommelier treated us to wines from the Trento region. 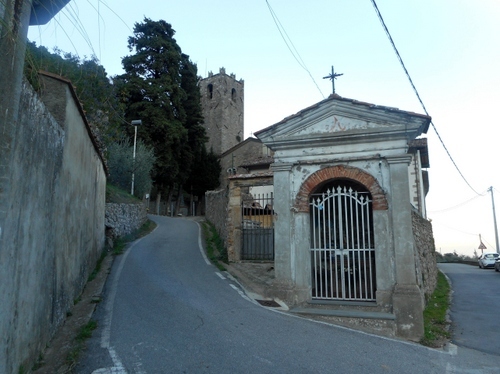 Somewhat later than planned we made our way to a hill village in the Pisan Mountain called Ruota (literally wheel) where our host has an olive grove. 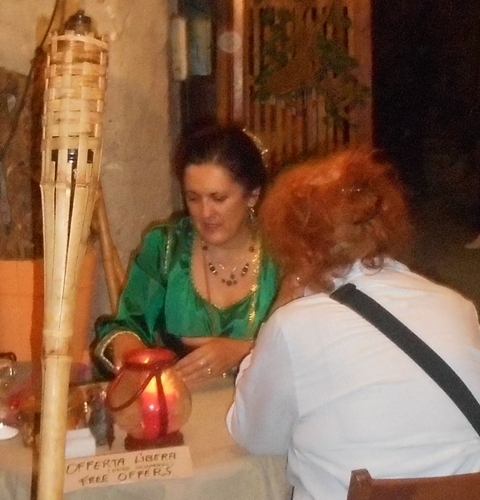 We’d been to Ruota before to take part in its attractive living crib last Christmas (see my post at https://longoio2.wordpress.com/2014/12/27/a-spectacularly-living-christmas-crib/ ) but were not aware that the place is also famous for some of the best olive oil produced in Tuscany. In November the fruit is in full maturity and now’s time to collect it. Many hands make light work. With sheets to collect the olives and with a special machine to shake the olive trees and encourage them to drop their precious fruits we collected a fair amount of olives. The problem was that the grove has over 180 trees and we only managed to do barely half a dozen of them! No problem. The occasion was mainly a social rather than an agricultural one and doubtless we’ll be back during the week to help out collecting the fruit from this sacred tree whose oil was used to anoint kings and athletes in ancient Greece and which remains a symbol of fertility, wisdom glory, abundance, purity and peace. Yesterday morning I helped out a friend with his vendemmia, or wine harvest. I found that the entire red grapes had been picked so I was set working on the white grapes instead. The vineyard extends along the entrance to the Camaione valley at Bagni Ponte and, like most vineyards in this part of the world, steeply climbs up a hill, enabling the vines to get the maximum of sunshine without the rows obscuring each other. This is particularly important in a mountain area like ours where the average temperature is rather lower than the standard Tuscan vineyard. Armed with a set of secateurs I started collecting the clusters on the vines. It was difficult not to put some of the grapes in one’s mouth, so deliciously sweet they were. The clusters were put into plastic baskets which were then carried to a hut where the grapes were stripped from their stalk and prepared to make the mosto or must. The amount of red mosto was quite considerable, although not as abundant as some previous years. However, the grape quality was very good as the vines had been fed recently by an abundant amount of rain. 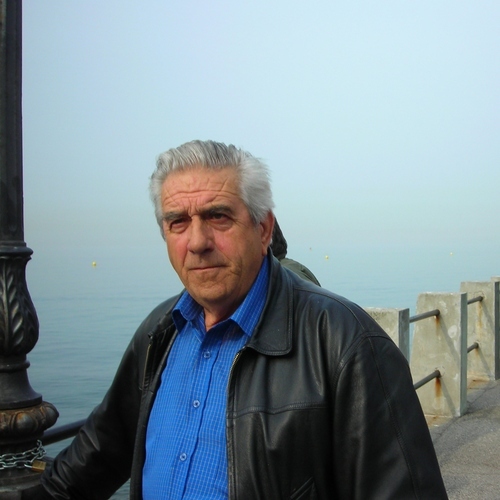 My friend’s wine quality has improved considerably ever since he bought the charming villa and surrounding vineyards. I’ve never tasted any of his white but, judging by the grapes I picked, it should be very palatable when matured. La vendemmia is a very sociable event in all parts of Italy and family and friends are called in to help up with the grape picking. 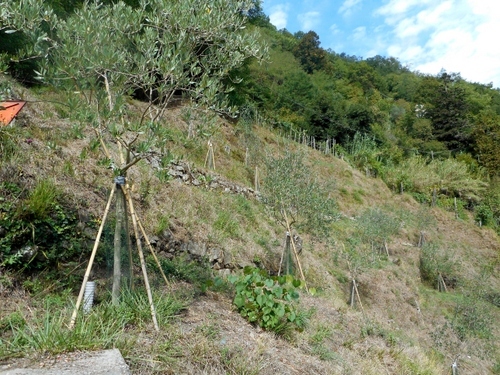 Judging by the number of olive trees my friend has planted there could well be an olive harvest in a few years time.